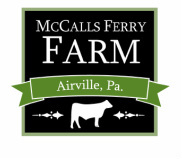 Does your family love McCalls Ferry Farm beef and pork? Our larger beef and pork packages allow you to buy our meat at a significant discount! We are happy to accommodate preferences for cuts when possible, but no substitutions are available at these prices. Package Order Form - Order today! Submit the form below to order a McCalls Ferry Farm package! Within 48 hours of submitting this form, a McCalls Ferry Farm family member will reach out to you to confirm your order and any order preferences listed (please identify specific cuts of steaks or roasts, types of sausage, etc.). We will do our best to adhere to desired delivery/pick up dates. Orders are only open to residents in Pennsylvania (Adams, Berks, Chester, Lancaster, Lebanon and York Counties), Maryland (Baltimore, Carroll, Frederick, Harford, Howard and Montgomery Counties) and Virginia (Fairfax County). After submitting the Package Order Form, click on the link to PayPal below to pay for the package. Be sure to first complete the form above with your desired package selections and hit the "submit" button. Then, pay for your order using the PayPal button below.